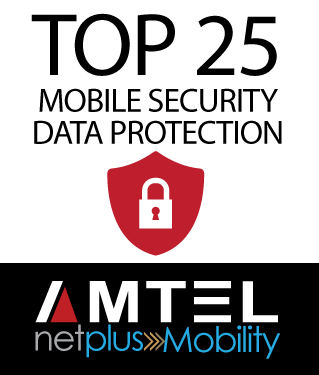 Amtel by NetPlus Mobility made the list as part of CRN’s Mobile 100: 25 Coolest Mobile Security And Data Protection Vendors. Amtel by NetPlus Mobility offers simplified enterprise mobility management in all areas of mobile security including containerization of sensitive corporate data, control over corporate email access on devices, and geo-fencing and location-based security. “As more and more organizations deploy mobile devices CIOs and IT departments are driving the need for feature rich mobile security solutions that complement existing security functions on Apple iOS and Android devices. Amtel by NetPlus mobility has soared in popularity because it has full scale security features with granular controls and it’s easy to deploy and use,” said Matt Lewis, President of NetPlus. Amtel by NetPlus Mobility is part of Apple’s Device Enrollment Program (DEP) which offers zero-touch configuration and streamlined setup, further simplifying the implementation process for organizations. Additionally Amtel by NetPlus Mobility is compliant with Samsung Safe and Samsung Knox. Amtel by NetPlus Mobility simplifies mobile collaboration, helping organizations to improve operating efficiency, mobile worker productivity, and compliance. Organizations worldwide use Amtel by NetPlus Mobility’s enterprise mobility management solutions, for protecting mobile access to enterprise data, and for taking control of apps and expenses, with workspace containerization for corporate and BYOD devices. To read more about CRN’s Mobile 100 please visit CRN.com.